Mangala’s Mangala Budget was approved in its Second Reading by a two-thirds majority in Parliament last week. It would have certainly boosted his morale. Yet, so were the budgets presented by his predecessor as well. But, ex ante, as private research institute Verite Research had found (available at: http://www.budgetpromises.org/en), the Budget 2017 had gone into a dark abyss with only 3% of the proposals being implemented by mid-2017 and a further 32% remaining at various stages of implementation. Altogether, 65% had been ignored and of them about 50% had not even been able to supply the necessary information to make a meaningful evaluation. As economists would say, they had been in a black box. 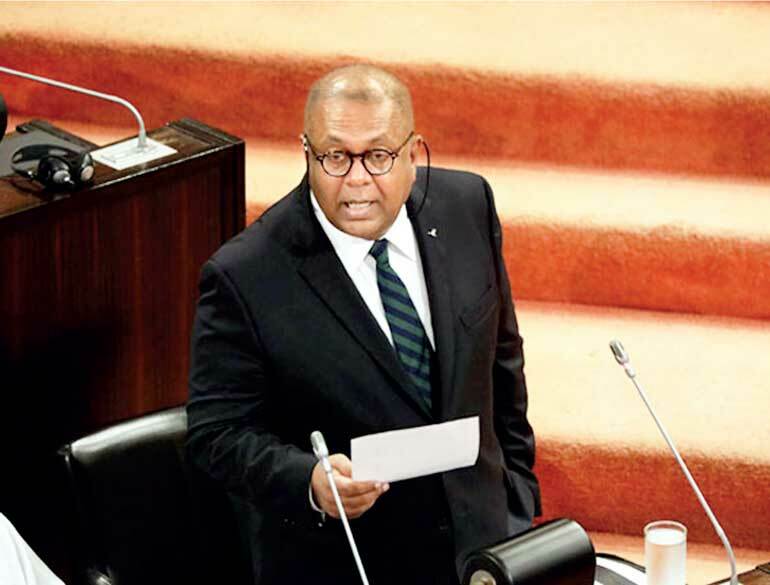 This is not a good performance and, therefore, both the Government and Mangala should refrain themselves from being euphoric about the success in Parliament in the last week. That is because his whole intention is to bring in prosperity to his fellow citizens within the shortest time possible. That requires him to implement the budget proposals to the letter within the timeframe prescribed by Parliament. Any other gain on account of the Budget should, therefore, be secondary to his main objective. Sri Lanka had been a promising nation at the time of independence. Its well-trained civil service, a high level of foreign reserves and increased market access had placed it above its peers. It had been named by Singapore’s Lee Kuan Yew, as recalled by Mangala, as ‘the model colony of the British Commonwealth’. To many, it had been ‘the Switzerland of the East’ – small but blessed with unparalleled economic strengths. Yet, Sri Lanka became a laggard, while its peers who had been behind it at that time, had attained economic successes in leaps and bounds. A good example is the economic successes of the newly independent British colony – Singapore – over the last four decades or so. Overcoming its poverty in natural resources, it became an industrial powerhouse within a single generation surpassing economic growth rates that had been attained by any other nation in the recent past. It was really a miracle. Then, many would ask the question: ‘If Singapore, a resource poor country, could do it, why not Sri Lanka?’ Many, therefore, point out that the Singaporean miracle could be replicated in Sri Lanka as well. As laboriously documented by Lee Kuan Yew in the second volume of his autobiography, From Third World to First, this miracle had been performed by Singapore by introducing economy-wide economic reforms continuously and consistently. To enable foreigners to invest and work in Singapore, it was made a ‘Western Oasis’ with respect to environmental and other facilities. Since the country could not attain much by trading with its poor and rival neighbours, Singapore adopted the deliberate policy of trading with the rich West, known as a ‘leap-frogging’ policy – a term borrowed from a popular game played by kids. In this game, one kid stands bending her back and other kids jump over her to a spot ahead of her. Education was geared to developing a pool of smart modern human capital from schools to universities. Ignoring the protests made by ethnic Chinese, English was made the medium of instruction at all educational institutions. Universities were encouraged to get themselves linked with reputed universities in the United States. School curricula were modified to focus on science, technology, engineering and mathematics or STEM. In the non-STEM disciplines, entertainment was promoted as a subject at universities and technical colleges to facilitate tech-savvy Singaporeans to capture a part of the vast global entertainment market. By establishing a currency board instead of a central bank, Singapore was able to free the supply of money from greedy politicians. If politicians wanted to incur vote catching expenditure programms, as opined by Singapore’s first finance minister – Goh Keng Swee, they should bring money from homes. Thus, it could maintain money supply at levels required by the economic expansion and thereby a low inflation regime throughout. The outcome of this restrictive policy was the maintenance of the country’s competitiveness with low inflation back at home. This was a stark difference from what its peers like Sri Lanka had been following. By permitting self-interested politicians to capture the key to money supply, they had continuously inflated their respective countries at the cost of eroding their international competitiveness. Government services were reformed to make them more efficient and facilitate private sector growth. Mangala has therefore vowed in the Budget to introduce economic reforms that are necessary to increase the rate of economic growth. Economic reforms are needed to make both investments and doing business easier. For instance, in the Ease of Doing Business Index, compiled by the World Bank, Sri Lanka is ranked low, meaning that it is difficult to do business here. This low ranking has also slipped downward from the 75th position in 2006 to the 111th position in 2018 despite the bold public pronouncements made by political leaders in the present as well as the previous administration that they would create a business-friendly country. A point made by the World Bank ever since it started to compile this index has been the difficulty for a new company to get an electricity connection. With a multitude of procedures followed by the Ceylon Electricity Board or CEB, says the World Bank, it normally takes about 100 days to get an electricity connection at a thumping cost of about Rs. 4.5 million. This writer personally knows how it is difficult for a customer who has installed solar power panels to supply electricity to the Board during the daytime to have the necessary digital meter installed. Even with repeated pleas made to CEB officials, it takes about 50 days to have the net meters fixed, but not before the installing company has gratified the officials concerned. No successive government has been able to stress this point to CEB officials and get them to simplify their procedures. It is encouraging that Mangala has taken upon himself the responsibility for introducing pro-growth reforms and fast-tracking economic liberalisation. But it is an enterprise which the whole Government has to embark on together and not just him. 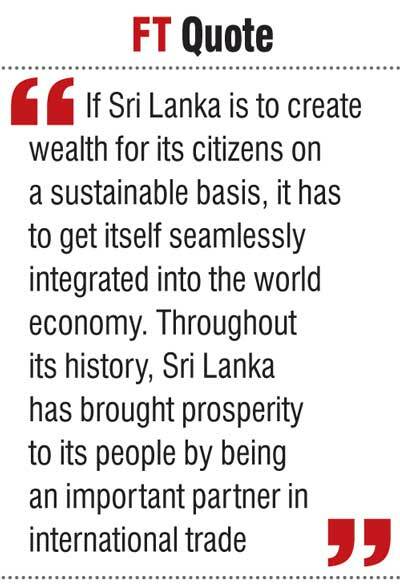 If Sri Lanka is to create wealth for its citizens on a sustainable basis, it has to get itself seamlessly integrated into the world economy. Throughout its history, Sri Lanka has brought prosperity to its people by being an important partner in international trade. During the reign of King Parakramabahu, the first in the 12th Century, Sri Lanka was a vibrant trading centre. The king, in order to raise funds to wage war with other local rulers, had established a special export processing zone called Antharanga Dura in the area bordered by the Kalu Ganga, Bentara Ganga and Sinharaja mountains. To protect his trading rights when the king of Ramagna Desa which, is presently called Myanmar, had increased the border duty on Lankan elephants passing through his country to China from 30 silver coins to 1,000 silver coins, he invaded the Ramagna Desa and re-established his trading rights. Civil servants to be recruited to the Government had to learn foreign languages, among others, so that they could communicate effectively with traders coming from almost all parts of the world. Thus, it appears that during the Parakramabahu era doing business in Sri Lanka would have been easier than it is today. Mangala’s objective is to regain that era through effective economic reforms and economic liberalisation measures. At a post-Budget seminar, he is reported to have reaffirmed his commitment to these reforms claiming that they are non-negotiable. But he alone cannot bring about the needed reforms. For that he has to be supported by his Cabinet colleagues who have to take it forward continuously and consistently. The bunching of the payment of interest and repayment of the maturing public debt, known as debt servicing, during 2018 to 2020 has posed a serious challenge to the Government. According to published data, the debt servicing liabilities will amount to Rs. 1,970 billion, Rs. 2,410 billion and Rs. 2,585 billion, respectively, in 2018, 2019 and 2020. The estimated revenue in each of these years will fall marginally below the liabilities given above. Hence, new debt has to be contracted not only to finance the budget deficit but also to generate resources to prevent a default of debt servicing obligations. This adds to public debt, making it more difficult to service it in the years to come. Accordingly, the present Government will soon lose its right to charge the previous Government for indebting the country. Mangala has suggested a special levy on total transactions made through banks at the rate of 20 cents per every Rs. 1,000 of such transactions. This special levy, effective from 1 April 2018 for three years, will have to be absorbed by banks without passing onto customers. The total amount to be raised by this special levy in 2018 has been estimated at Rs. 20 billion based on a total volume of annual transactions of about Rs. 100 trillion. But it brings in only about 1% of the total debt repayment obligations due in that year. It is just a peanut and will not solve the Government’s debt repayment problem. Thus, to find resources to repay debt, the Government will have to borrow more, thereby adding more to the country’s debt stock. Such a strategy, though it helps the Government of the day, will not ease the burden of governments that are to come to power in the future. The 19th Century French economist Frederic Bastiat called such economists, who see only the relief in the current period and ignore their future consequences, bad economists. Why should Mangala kill the cash cow? This proposed levy on financial transactions is not a new thing. Even the former Finance Minister Ravi Karunanayake proposed such a levy on financial transactions at the rate of 50 cents per every Rs. 1,000 of such transactions. However, due to protests by financial institutions, this proposal was not implemented. Now it appears that the Treasury officials who have made this suggestion to Mangala are unwilling to leave such a cash cow unexploited. They become a huge cash cow since the total of the cash transactions among banks, according the Central Bank data, had been around Rs. 103 trillion in 2016. In 2018, this may further go up to about Rs. 110 trillion. But they include all transactions in the system, namely, those done by commercial banks and primary dealers through the Central Bank’s Real Time Gross Settlement System or RTGS, all retail value payments done through cheque clearing, Sri Lanka inter-bank payment system or SLIPS, credit and debit cards, internet and phone banking and transactions done through the postal department. In terms of purpose, they cover payment of taxes, contribution to and repayment of public debt, foreign exchange transactions, undertaking import and export businesses and withdrawal of cash from banks and repayment of loans. This is too vast a tax base with a multitude of cascading effect. Hence, it is necessary to define precisely what is meant by a bank and what is meant by a financial transaction. If it covers only commercial banks, the ability of small banks with low profit margins to absorb this special levy is questionable. Further, banks will have to revise their computer systems to accommodate such payments to the Government. Why should Mangala make banking a complicated business when he has other easier methods to attain the same objective? Perhaps, Mangala may have chosen this special levy because of his unwillingness to mess up with the new Inland Revenue Act considered as a model for Sri Lanka. According to this legislation, taxes that have to be imposed have been fairly streamlined. Thus, imposing another direct tax on banks would have corrupted the provisions of the new Inland Revenue Act. But, to save the Inland Revenue Act, he has imposed an enormous burden on banking and financial institutions, tarnishing his avowed goal of making Sri Lanka a business-friendly nation. A direct tax on banks, if he intends to exploit that cash cow, would have been more appropriate than bringing in another complicated indirect tax. However, the long-term solution to the rising public debt problem is not through such palliatives. It is through restructuring the Government, cutting down its wasteful expenditure, halting the drain of resources in loss making enterprises, and introducing the system-wide thrift measures. Without them, what would actually happen will be the ever-increase in the country’s debt stock allowing future governments to blame Mangala and his Cabinet colleagues for driving the country to greater indebtedness. If Mangala is wise, he would avoid this risk at all costs.